The experiment involved teaching dogs a new behaviour (looking at the experimenter) using positive reinforcement, and then trying to extinguish it. Forty-five pet dogs took part. They were tested individually, either indoors in a confined area, or outdoors in an open space on a 2m lead. Eighteen dogs were tested outdoors, and a further twenty-seven were tested indoors for the purposes of this study. A container of dried liver treats was put on a shelf where the dog could see it but couldn’t reach it. First of all, the dogs were given a ‘warm-up’ to get used to the room and the experimenter, who gave them three treats during this session. Then the dog was taught that if it looked at the experimenter, she would give them one of the liver treats. This acquisition phase included three trials of 2 minutes each, with a 2 minute gap in between. At the beginning of each trial, the experimenter called the dog’s name to get their attention, and then gave a treat; thereafter she rewarded the dog each time it looked at her. Then the extinction phase began, and also consisted of three 2-minute trials with a gap in between. Now, when the dog looked at the experimenter, it was not rewarded. As before, she stayed in the same place looking at the dog during each of the trials, and left the area in the gap in between trials. All sessions were video-taped and the dog’s behaviour was analyzed. 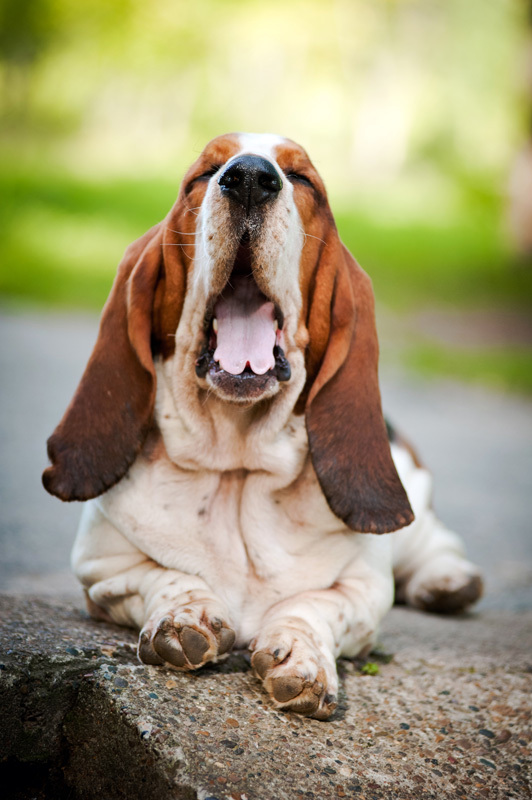 It’s worth noting that the dogs did not show signs of great stress, such as yawning, crouching low, or a low tail, at any time. Throughout the whole study, dogs’ tails were in the middle, or neutral, position. Across the acquisition phase, dogs increased their gaze at the experimenter, showing that they learned the behaviour. By the third trial all of them stayed close to the experimenter. During the extinction phase, however, 44% of the dogs moved away from the experimenter, almost all of them (98%) turned sideways to her, and some even laid down (29%). During the extinction phase, dogs were more likely to walk around, sniff, and vocalize (especially whining). This shows that the dogs experienced frustration. Now some readers are probably thinking this is a good thing, meaning that if the dog is frustrated then the procedure is obviously working to get rid of the (now-unwanted) behaviour. However, the authors point out that stress can affect learning. They say that being able to recognize these behaviours in a dog can help people decide whether to continue with the training procedure, take a break, or try a new approach. Another useful point to come from this relates to times when people are trying to teach a new behaviour. Often, things will be going well for a bit, and then the dog will spontaneously stop producing the behaviour. This means it doesn’t get the reward – hence potentially becoming frustrated. Knowing the signs to look for can help a dog owner know when to take a step back and make the situation easier for the dog, thus helping it to learn more quickly. The acquisition and extinction phases of this study were shorter than would typically occur in real-life. However, one of the nice things is that since it took place in a location familiar to the dog, with a typical training situation, it does generalize. The behaviours shown during extinction were turning sideways, laying down, walking around, sniffing, and vocalizing. Knowing that these are indicators of frustration can help people to improve their training skills. A good trainer is always paying attention to their dog. How do you get on with training your dog(s)? Have you ever noticed any of these signs of frustration? I'm in the middle of training an 8 month old weimaraner. I don't often see frustration except in one occurrence. She has been trained to ring a bell hanging off the door nob when she needs to go outside, but often we won't answer her if she has been asking to go in and out 4-5 times within the last ten minutes. She will lay and stand and start to whine, and even make slower, more deliberate motions to ring the bell. We actually have to cross-train her for things like jumping, as ignoring her only makes her more persistent. A jump is immediately corrected with a sit. I love Weimaraners! Thanks for sharing. Teaching a sit and then rewarding it with affection and/or treats is a great way of training a dog not to jump, because it's not possible to sit and jump at the same time. That's exactly the kind of strategy you can use as an alternative to just ignoring jumping.